Wae AbdulKadir, W. A. F., Md. Yunos, K. F., Hassan, A. R., Mohd Amin, N. A., and Samsu Baharuddin, A. (2019). "Fabrication and performance of PSf/CA ultrafiltration membranes: Effect of additives for fouling resistance and selective polyphenol removal from apple juice," BioRes. 14(1), 737-754. 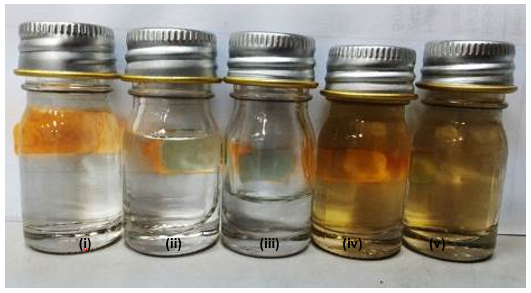 This work focused on the addition of different pore formation-controlling agent to a polysulfone/cellulose acetate blend membrane via immersion precipitation using phase inversion technique to improve the fouling resistance and selective polyphenol removal of apple juice. The membranes were prepared by blending hydrophilic polyvinylpyrrolidone (PVP) and amphiphilic Pluronic F127 (Plu) with polysulfone/cellulose acetate matrix in N-methyl-2-pyrrolidone. The morphology, mechanical strength, flux permeation, flux recovery ratio, and polyphenol separation of these membranes were characterized. It was found that the fabricated membranes with addition of PVP and Plu were more effective than the membrane without a pore formation-controlling agent. The flux recovery of the membranes with combined pore formers after ultrafiltration of bovine serum albumin increased from 12.4% to 66.9%. The selectivity of polyphenols increased from 6% to 79% with an improved flux recovery of 79%, which shows the reduction of yellowish-brown pigment in apple juice. The development of new materials for membrane fabrication is one of the main research elements for advances and enhancements in membrane technology. The various membrane processes are related to the pore size of the membrane, which determine the diffusion and retention of particles. The separation of membranes has a broad range of applications in many industries, such as in the food processing, wastewater, pharmaceuticals, paper, and textile industries (Mansourpanah et al. 2011; Razzaghi et al. 2014). There are four well-known separation processes: microfiltration, ultrafiltration, nanofiltration, and reverse osmosis. Ultrafiltration membranes are the most suitable for bio-separation, an example of which is the clarification of apple juice in the agro-industry (Borneman et al. 2001; Conidi et al. 2011; Echavarría et al. 2011). Therefore, selection of an appropriate material is a crucial factor to improve the membrane properties, such as the morphology, hydrophilicity, and mechanical and thermal stability (Bowen et al. 2002). Polysulfone (PSf) is the most recognized polymer in membrane applications. Repeating phenylene rings increase the degree of molecular immobility, which results in a high mechanical strength, high rigidity, and creep resistance (Bowen et al. 2001; Sivakumar et al. 2006a; Arthanareeswaran et al. 2010). However, membranes using PSf polymer have limited practical applications due to the hydrophobic membrane properties, which have resulted in severe membrane fouling. The hydrophobic properties can be improved through blending processes (Sivakumar et al. 2006b; Yu et al. 2009; Homayoonfal et al. 2010). Thus, membranes with blended polymers have a better opportunity for good permeability compared to those of single polymer membranes. Cellulose acetate (CA) is a common and important membrane material used in fabrication of pressure-driven membranes. The advantages of CA polymer include high biocompatibility, good toughness, high potential flux, and relatively low cost (Saljoughi et al. 2009). The hydrophilicity of CA polymer can improve the fouling resistance of membrane application. However, the CA polymer suffers from low oxidation tolerance, low chemical resistance, and poor mechanical strength, which lead to low resistance to aggressive cleaning processes (Sivakumar et al. 2000). Therefore, the blending of different polymers has enabled researchers to obtain a new approachable material for membrane fabrication with an extensive variety of intermediate properties between that of the pure components. The balance of hydrophobic-hydrophilic and the properties of the membrane system can be adapted when multi-component polymer blends are used in membrane fabrication (Sivakumar et al. 2006a). Furthermore, the formation of the pore size during membrane fabrication has also become an important factor in the membrane performance. The presence of solvent (e.g. N-methyl-2-pyrrolidone, NMP) during phase inversion process has induced the formation of pores. However, the presence of pore formation-controlling agent helps in adjusting the pore size and the distribution of pores on the membrane surface. Therefore, the pore formation-controlling agent in the asymmetric membrane changes the pore size of the membrane. The exchange rate between the solvent and non-solvent during phase inversion leaches the pore formation-controlling agent out and forms a membrane (Sivakumar et al. 2006a; Ali et al. 2012). The factors that alter the porosity and pore size of the membrane are complex. Pore formation-controlling agents with different concentrations and polarities significantly influence the membrane morphology and permeation. In this study, PSf and CA were blended together in the presence of the pore formation-controlling agents polyvinylpyrrolidone (PVP) and a type of triblock copolymer, polyethylene oxide/polypropylene oxide/polyethylene oxide (Pluronic F127, Plu) during the preparation of the polymer solution with different pore former compositions. The hydrophilic PVP and amphiphilic Plu were investigated in a previous study on polyethersulfone (PES) membranes, and it was found that Plu has a high stability with a better performance as a modifier agent (Susanto and Ulbricht 2009). Moreover, the concentration of Plu has facilitated the formation of the finals droplet size, which stabilizes the emulsion droplets of NMP, resulting in smaller droplets dependent on the interfacial tension. This is due to the amphiphilic structure that causes a high tendency of Plu to accumulate and adsorb strongly at interfaces with lower interfacial tension. A contracting force that is exerted on the interface results in a minimization of interfacial area. The changes in shape or size of interface leads to the changes of loading Plu on the interface by desorption or absorption and the value of the interfacial tension (van der Graaf 2006). Hence, the Plu has better stabilization of emulsion droplets compared to PVP because PVP has only hydrophilic segments, which could not adsorb strongly to the interfaces. The main objective of this study was to determine the most effective pore former composition in a PSf/CA membrane. The findings of this study are intended to provide an in-depth understanding of the addition of pore formation-controlling agents in polymer matrices and to facilitate further investigation of the potential combination of pore formation-controlling agents. The combination of hydrophilic and amphiphilic pore formation-controlling agents produced a new membrane characteristic that is better for application in related industries. The PSf (Ultrason E 2010) was supplied by BASF (Ludwingshafen, Germany) and was used after drying at 60 °C for 24 h. The CA (molecular weight (Mw) = 100,000 Da) was obtained from Acros Organics (Geel, Belgium). The N-methyl-2-pyrrolidone (NMP) was purchased from Merck (Darmstadt, Germany). Polyvinylpyrrolidone with a Mw of approximately 58,000 Da was purchased from Acros Organics and a type of triblock copolymer, polyethylene oxide/polypropylene oxide/polyethylene oxide (Pluronic F127) with a Mw of approximately 12,600 Da was obtained from Sigma Aldrich (St. Louis, USA). Bovine serum albumin (BSA; Mw = approximately 66,000 Da) was obtained from Sigma Aldrich and used as a module solution for bio separation. Disodium hydrogen phosphate dihydrate (Na2HPO4·2H2O) and sodium dihydrogen phosphate monohydrate (NaH2PO4·H2O) were purchased from Merck. The nitrogen gas was supplied by Stable Arm Sdn. Bhd. (Bangi, Malaysia). All of the other chemicals were of commercial analytical grade and used without further purification. Apple juice without further treatment was obtained from a local market for determination of the selective removal of polyphenols (average Mw = 10 kDa to 100 kDa). The polymer solutions (20 wt.%) were prepared by blending PSf and CA polymers with different pore former compositions (PVP, Plu, and PVP/Plu) in NMP (Table 1) under constant stirring for 8 h at 60 °C. These membranes were cast via non-solvent induced phase separation (NIPS) technique (Borneman et al. 2001; Sivakumar et al. 2006b). Before casting, the polymer solutions were left to stand after a heating process to ensure that no air bubbles were present. The membranes were cast on a glass plate with a casting knife and the thickness of the membrane was maintained at 200 µm (0.20 mm ± 0.05 mm). The spread polymer solution was immersed immediately into a coagulation bath (water) which acted as non-solvent at room temperature. The solidified membrane was immersed in water for 24 h to remove the residual solvent. After 24 h, the membrane was immersed in ethanol and hexane for additional washing. In ethanol, the membrane was immersed for 24 h, while the membrane was immersed for a continuous 2 h in n-hexane for washing. The membrane was dried at room temperature for 1 d to 3 d before testing the performances. where Jw1 is the water flux (L/m2h), Q is the volume of the permeate (L), A is the area of the membrane (m2), and t is the time (h). The morphology analysis of the PSf/CA membranes was evaluated using scanning electron microscopy (SEM) (NOVA NANOSEM 230, FEI Company, Hillsboro, USA) with user-friendly Windows xT software (xT 6.2, Hillsboro, OR, USA). The membranes were cut and fractured in liquid nitrogen. The fractured membranes were then sputter-coated with gold for 1 min to 2 min. The cross-section images of the blend membranes were obtained at different magnifications. The mechanical strengths of the blend membranes were measured using the TA-XT plus Texture Analyser with Texture Exponent Software Version 2.0.7.0 (Stable Microsystems, Godalming, UK) at room temperature and a stretching rate of 5 mm/min. The samples were cut to the dimensions 63.5 mm × 12.7 mm, according to the standard ASTM D256 (ASTM International 2010). where FRR is the percentage of the flux recovery ratio (%), Jw1 is the water flux of the neat membrane (Eq. 1) (L/m2h), and Jw2 is the water flux of the cleaned membrane (L/m2h). where R is the rejection of the solute (%), Cp is the concentration of the permeate (mg/L), and Cf is the feed concentration (mg/L). The results of the fabricated membranes focused on the effectiveness of the addition and incorporation of pore formation-controlling agents in the membranes and the effect on the flux permeation, fouling resistance, and selective polyphenol removal of the apple juice. The effects of different pore formation-controlling agent compositions (PVP, Plu, and PVP/Plu) on the water flux of the PSf/CA blend membrane at different times are shown in Fig. 1. PSf/CA membrane without the pore formation-controlling agent had a flux of 77.4 L/m2h initially and the flux decreased to 29.7 L/m2h after 2 h of compaction, which was higher compared with the initial flux of the PSf/CA-PVP membrane (7.67 L/m2h). Compaction of the polymeric membrane under hydraulic pressure caused a change in the membrane structure that reduced the membrane porosity. However, the addition of Plu (PSf/CA-Plu) and PVP/Plu (PSf/CA-PVP/Plu) increased the flux to 108 L/m2h and 82.9 L/m2h, respectively, compared to those of the PSf/CA membrane for the first 30 min of compaction. The addition of a pore formation-controlling agent seemed to alter the morphology and behavior of the membranes. The presence of PVP in the membrane may lead to development of a more extensive pore network, and acted as a non-solvent swelling agent (Qin et al. 2003). The cross-section SEM image of the PSf/CA-PVP membrane showed the formation of large macrovoid defect growth and sponge-like structure in the membrane layer. The widely accepted hypothesis from the previous study on the mechanism of macrovoid growth by diffusion alone was difficult to explain, as the macrovoid formation was found to rapidly appear within ~1 to 2 min and due to the high polymer concentration in and near macrovoid structures (Greenberg et al. 2003). Meanwhile, this membrane was observed to have a small pore size on the top surface of the membrane. The presence of PVP molecules increased the polymer concentration and led to a high viscosity of the polymer solution. Thus, a reduction was observed in the membrane permeability. Similar behavior was reported in a previous study on the effect of polyethylene glycol (PEG) on PSf membranes (Ma et al. 2011). Furthermore, the Plu additive showed an ability to improve the flux permeation with a gradual decrease in flux with compaction time. However, the combination of both Plu and PVP resulted in a slight decrease of flux. The low leachability of the PVP was attributed to the higher affinity of the Plu with the non-solvent than the PVP, which tends to slow down the exchange rate of the non-solvent (Zhao et al. 2008). Additionally, the different flux behaviors were influenced by the quantity of the pore formation-controlling agents that were incorporated in the polymer matrix. The incorporation of a pore formation-controlling agent modified the conformation of the PSf and CA chains during demixing process. Hence, this has affected the polymer dispersive status and the dynamic rate of the membrane formation progress (Arthanareeswaran et al. 2010), which resulted in different membrane performances. After undergoing a compaction process at 150 kPa, the membranes were subjected to pure water permeation (PWP) and fouling studies. The effect of the pore formation-controlling agent composition on the PWP of the blend membranes is presented in Fig. 2. The PWP of the PSf/CA membrane without the additive was 5.92 L/m2h. The PWP increased from 5.92 L/m2h to 206 L/m2h as the pressure was increased from 100 kPa to 300 kPa. Similar observations were reported by Sivakumar et al. (2006b) for PSf-CA membranes with 15 wt.% polymer. Moreover, the incorporation of pore formation-controlling agents into the polymer matrix of the PSf/CA membrane showed a lower trend of flux. The lower trend of PWP in this study was due to the high viscosity of the polymer solution. The composition of 20 wt.% base polymer concentration with the addition of pore formation-controlling agents was used in this study, which notably increased the viscosity of the polymer matrix. A previous study reported that the addition of a hydrophilic polymer induces liquid demixing in the phase separation and hinders the exchange rate of the solvent and non-solvent due to the high viscosity. Meanwhile, a polymer solution without a pore formation-controlling agent induces a rapid exchange of non-solvent inflow because of the low viscosity (Lee et al. 2003). The incorporation of PVP and Plu individually resulted in low fluxes of 16.6 L/m2h and 47.0 L/m2h, respectively. Meanwhile, the combination of PVP and Plu slightly decreased the flux from 206 L/m2h to 143 L/m2h. The significant reduction in the flux of the PSf/CA-PVP and PSf/CA-Plu membranes compared to those of PSf/CA-PVP/Plu membrane could have been due to the low leachability of the single pore formation-controlling agents that led to the formation of narrow pore sizes. This was also related to the high concentration of the polymer solution, which produced smaller pore sizes in the membranes. Previous studies have reported that higher polymer concentration resulted in the lowest percentage of porosity and permeability coefficient (Ahmad et al. 2005; Hamzah et al. 2014). Additionally, the densification of a more porous support layer at a high pressure was found to have thickened the skin layer as a selective barrier and led to the reduction of the flux (Susanto and Ulbricht 2009). However, the incorporation of Plu resulted in a higher water flux compared to the incorporation of PVP. The interaction of the Plu with the membrane molecular structure facilitated the enhancement of water flux and fouling resistance due to the presence of the polyethylene oxide (PEO) chain length in the chemical structure (Susanto and Ulbricht 2009). Hence, the Plu in the PSf/CA-PVP/Plu membrane was found to improve the flux permeation due to the presence of Plu, which tends to encourage the formation of numerous pores on the membrane surface (increased pore distribution) with its hydrophilic PEO chains in the membrane matrix. The SEM analysis was carried out for PSf/CA membranes with and without pore formation-controlling agents. The SEM images of the top surface and cross section of the membranes are shown in Figs. 3 and 4, respectively. In Fig. 3, the high surface area of the pore distribution on the top surface of the membranes in the presence of the PVP and PVP/Plu was observed. The addition of the PVP was found to improve the pore distribution on the membrane surface compared to PSf/CA membrane and the surface area of the pores was influenced by the concentration of the PVP in the membrane polymer matrix (Sivakumar et al. 2005; Sivakumar et al. 2006a). From the SEM analysis, the pore size and molecular weight cut-off of these fabricated membranes were also determined (Table 2), which remarkably influenced the flux performance. Furthermore, mixing of the PVP and the Plu increased the porosity of the membrane surface, which was observed to form numerous smaller pores inside and outside of the large pores. The formation of a double layer of pores on the membrane surface rarely occurs. This might have resulted from the interaction of the Plu with the PVP and PSf/CA chains. Zhao et al. (2008) studied the effects of Plu on PES membranes and reported that there were three possible explanations for the membrane formation process with the incorporation of Plu: (1) formation of membrane matrix/Plu aggregations, (2) surface adsorption, and (3) micellization of Plu copolymers. Therefore, in this study, the PSf/CA-Plu aggregation could be related to the strong interaction between the PSf chains and hydrophobic segments of polyphenylene oxide (PPO) in the Plu, which bind the PSf/CA with Plu. Similar results were reported in the previous studies. It has been reported that PES and PSf share a similar sulfonate group structure in their polymer chains (Yamasaki et al. 2000; Zhao et al. 2008). Additionally, the tendency of surface adsorption to occur due to the amphiphilic behavior of the Plu and hydrophilicity of the NMP, water, and PVP which formed a layer of Plu/PVP molecules at the phase interface of the solvent (NMP) and non-solvent (water). Also, the large pores found in Fig. 3C could be due to the in-diffusion rate of the non-solvent between the PVP in the solvent and the continued rapid in-diffusion rate with the Plu. Consequently, more nuclei and the growth of highly concentrated polymer in the porous sublayer occurred. Fig. 4 shows an asymmetric structure consisting of a thin fine porous selective barrier (dense top skin layer) and thicker porous sub-structure (support layer). The skin layer is known as a separation layer that provides mechanical strength to the structure of the membrane, as explained in a previous study (Raslan and Mohammad 2010). The cross-section images of these membranes showed a similar structure of the finger-like voids in the sublayer of the membranes, except for the membrane in Fig. 4B, which shows a large macrovoid structure with a sponge structure in the bottom layer. The formation of large macrovoids in the sublayer of PSf/CA-PVP membrane was found to deconstruct the porous structure of the membrane. Sivakumar et al. (2006a) reported that the tear size of the pores increased as the concentration of PVP increased. The PVP composition in the polymer matrix and the viscosity of the polymer solution was observed to influence the formation of large cavities. Therefore, the concentration of 3 wt.% PVP in this study increased the tear size of the pores compared to the concentration of 3 wt.% Plu, which resulted in a fine structure of finger-like voids. Fig. 4C shows that the Plu have a better compatibility in the PSf/CA composition than single composition of PVP in the polymer matrix. This effect could be due to the strong association of the hydrophobic PPO blocks with the PSf/CA chains (Zhao et al. 2008). However, the non-uniform sizes of the finger-like voids of the PSf/CA-PVP/Plu membrane as observed in Fig. 4D could be related to the micellization process, where the Plu micelles were trapped in the skin layer during solvent and non-solvent exchange. These micelles facilitated in the formation of membrane pores and enlarged the membrane pore diameter (Faneer et al. 2017). Formation of large finger-like voids was found to occur due to the degree of leachability of the PVP. The leachability of the PVP depends on the Mw, which is determined by the chain length of the PVP (Basri et al. 2011; Yang et al. 2009). Thus, the PVP is considered to have a low Mw (58 kDa) with a shorter chain length, which facilitated in the tendency towards high leachability of the PVP during the demixing process. The images of the morphological analysis confirmed the effect of the pore formation-controlling agents on flux permeation. These effects were observed in the previous sections and mechanical properties and fouling studies in the following sections. The lower flux of the membranes with the presence of pore formation-controlling agents justified the results observed on the cross-section image of the membrane structure and the surface area of the pores on the membrane surface. These structures resulted in a lower flux of the membranes compared to the membrane without the pore formation-controlling agent. Among the compositions, the membrane with the combination of pore formation-controlling agents resulted in the more reasonable flux permeation. The incorporation of pore formation-controlling agents in the polymer solution decreased the mechanical strength of the membranes compared to the PSf/CA membrane without the pore formation-controlling agent. The reduction in the mechanical strength could be due to the increase in the porosity and formation of more voids than the PSf/CA membrane, which resulted from the entrapment of the CA and the pore formation-controlling agents in the polymer matrix. The entrapment of the CA in the polymer matrix also reduced the mechanical strength due to the relatively lower mechanical strength compared to the PSf membrane as reported in a previous study on the fabrication of PVDF/CA membranes (Razzaghi et al. 2014). 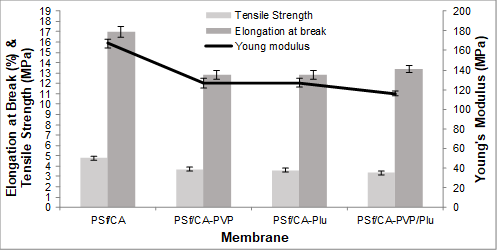 Figure 5 shows the tensile strength of the four membranes PSf/CA, PSf/CA-PVP, PSf/CA-Plu, and PSf/CA-PVP/Plu, which decreased remarkably from 4.7 MPa to 3.7 MPa, 3.6 MPa, and 3.3 MPa, respectively. However, the reduction in the tensile strength of the membrane with the combination of pore formation-controlling agents was higher compared to the single pore formation-controlling agent. This could be related to the hydrophilic chains of the PVP and Plu, which increased the size of the voids. In addition, the reduction in the tensile strength was due to the substitution of the CA polymer and the additives in the PSf blend with a mechanically strong property, as well as the subsequent incompatibility of the two polymers in the polymer solution. A similar trend was observed for the Young’s modulus. A reduction in the Young’s modulus for the membrane with more pores in the polymer solution was observed. Consequently, the incorporation of different pore formation-controlling agents decreased the elasticity of the blend membranes, as is shown in Fig. 6. The elasticity of these blend membranes (elongation at break) was found to decrease from 17.0% to 12.8%, 12.8%, and 13.4%. The mixing of both hydrophilic and amphiphilic pore formation-controlling agents led to a greater stretching rate. Hence, the different pore formation-controlling agents induced a high surface area of the pores with larger voids in the sublayer, while decreasing the mechanical strength of the blend membranes. The FRR values were used to evaluate the surface modification of the fabricated membranes. An increase in the FRR value indicates better hydrophilicity and antifouling properties of the blend membrane (Zhao et al. 2008). The FRR values of the fabricated membranes in the BSA solution and apple juice permeation were calculated and are shown in Figs. 6B and 7B, respectively. In the permeation of both the BSA solution and apple juice, the intermediate process was performed with hydraulic cleaning after filtration of the samples. The efficiency of this cleaning was evaluated from the FRR to clarify the antifouling property of the membrane (Peeva et al. 2011). 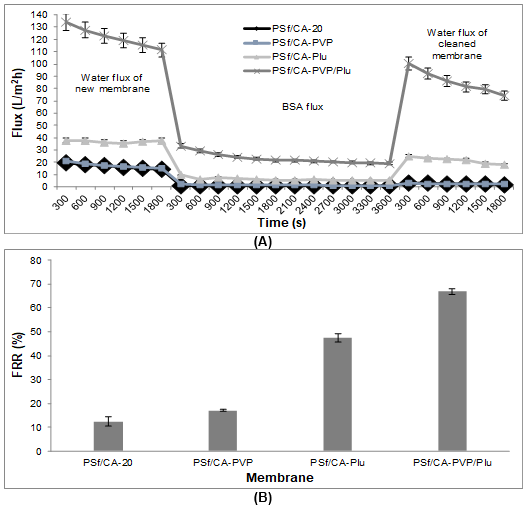 Figure 6 shows the permeation of the BSA solution, and the highest water flux of the PSf/CA-PVP/Plu membrane had a remarkably higher FRR value (67%) than the PSf/CA membrane and membranes with single additives. The enhancement of the pore distribution was observed on the membrane surface of the PSf/CA-PVP/Plu membrane. The interaction of the highly hydrated PEO layer and the hydrophilicity of the PVP chain encouraged the attraction of a large amount of free water. This conclusion was supported by a previous study that found that a sufficiently high free water fraction on a membrane surface led to a reduction in the protein adsorption (Zhao et al. 2008). The double layer of the pore structure of the PSf/CA-PVP/Plu membrane (morphology section) facilitated the permeate flux without instantaneous adsorption of the BSA molecules. Hence, reversible fouling occurred and the final flux recovered close to the initial water flux after the backwashing process. Figure 7 shows the changes in the water flux permeation after the apple juice permeation and the FRR between the initial and final fluxes on the different blend membranes. Among all of the blend membranes with pore formation-controlling agents, the PSf/CA-PVP/Plu membrane showed a better fouling resistance and flux recovery with a 79% FRR. The blend membranes with the pore formation-controlling agents seemed to be exposed to reversible fouling behavior, which mostly recovered the final water flux closer to the initial water flux. The PSf/CA membrane was an exception, which majorly decreased the final water flux and underwent a reduction in the permeate flux within BSA permeation. This happened because of the adsorption of polyphenols inside the membrane pores, which tended to cause pore clogging. This phenomenon was supported by a previous study on PES/PVP membranes and removal of polyphenols and color pigments (Borneman et al. 2001). Additionally, the intermediate process caused by caustic cleaning changed the behavior of the PSf/CA-Plu membrane. This membrane had advanced recovery with an FRR value of 583%. This might have happened because of a disturbance by the chemical reaction with the caustic solution that altered the membrane pores. Simon et al. (2013a) reported that this type of cleaning was effective for controlling the fouling phenomena and the recovery of membrane permeability was slightly more than 100% with a temporary enlargement of the membrane pores. The enlarged pores were not immediately returned to their normal condition after replacement with the aqueous feed solution at a neutral pH because of hysteresis (Simon et al. 2013b). Hence, an advanced flux recovery was observed, which was not suitable for further utilization. 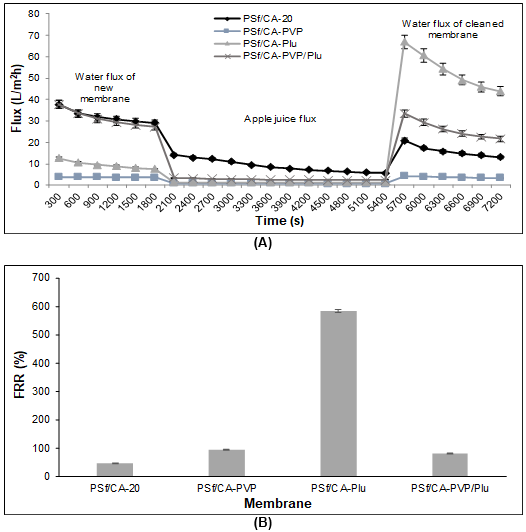 In this study, during observation after permeation of both the BSA solution and apple juice, the PSf/CA-PVP/Plu membrane showed a stable membrane structure compared with the membranes with a single pore formation-controlling agent. The interaction between the components in the polymer matrix seemed to have had a strong association that caused a constant flux recovery after exposure to backwashing and caustic cleaning. The flux recovery in both separations achieved FRR values of up to 67% to 79%, while the other membranes with only PVP (17% to 94%) or Plu (47% to 583%) had a large difference in the FRR values after the different hydraulic cleaning processes. The removal of polyphenols facilitated the clarification of the apple juice without any filtering aids, which are costly. The incorporation of these hydrophilic and amphiphilic pore formation-controlling agents notably enhanced the clarification of the apple juice (Fig. 10) and obtained a higher selective removal of polyphenols compared with the PSf/CA membrane (Fig. 8). Also, the average Mw of the polyphenol in the apple juice was determined to be 10 kDa to 100 kDa, which helped with retainment on the membrane surface, as the molecular weight cut-off of the fabricated membranes was larger than 10 kDa to 20 kDa, as is shown in Table 2. The incorporation of a single pore formation-controlling agent resulted in a higher removal of polyphenols compared to the combination of both pore formation-controlling agents. The schematic diagram in Fig. 9 illustrated that the rejection of polyphenol molecules decrease slightly with the increase in hydrophilic segments in the membrane matrix and the incorporation of these pore formation-controlling agents have shown an improvement in antifouling performance of the membrane. However, the permeate flux for the membranes with single pore formation-controlling agents was lower compared to that of the PSf/CA-PVP/Plu membrane (Fig. 10). The high removal of polyphenols for the PSf/CA-PVP and PSf/CA-Plu were related to the porosity and pore structures in the sublayer. The SEM images show that the PSf/CA-PVP/Plu had a higher porosity membrane surface with a non-uniform size of finger-like voids in the sublayer. The consequence of this has been explained in a previous study on the rejection of PEG (Razzaghi et al. 2014). Hence, a lower polyphenol removal of 79% was obtained for the PSf/CA-PVP/Plu compared to 86% and 82% removal for PSf/CA-PVP and PSf/CA-Plu, respectively. The results showed that the incorporation of pore formation-controlling agents in the polymer matrix induced a high surface area of the pores on the membrane surface with narrow pore sizes compared with the PSf/CA membrane. 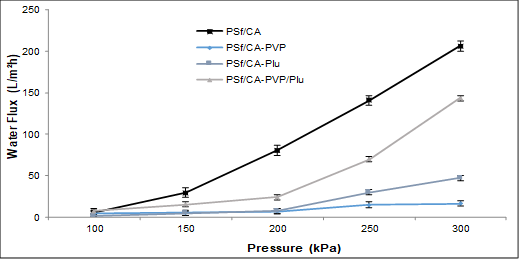 With the composition of the hydrophilic and amphiphilic pore formation-controlling agents, the PSf/CA-PVP/Plu membrane had the highest pure water permeation (PWP), porosity, and non-uniform finger-like voids in the sublayer. 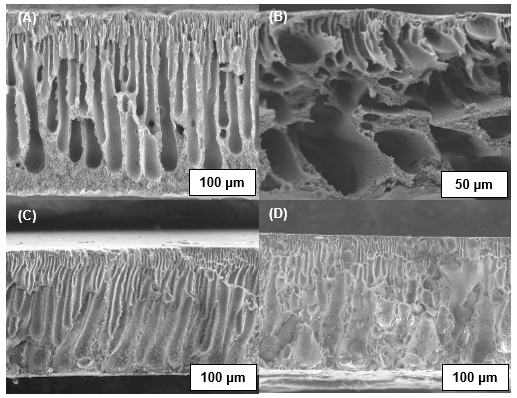 The morphology of this membrane assisted in the reduction of the reversible fouling to 67% and 79% flux recovery ratio (FRR) after hydraulic cleaning. The consistency of the membrane structure facilitated in achieving a constant range of flux recovery compared with the PSf/CA-PVP and PSf/CA-Plu when exposed to backwashing and caustic cleaning. The removal of polyphenols from the apple juice improved from 6% for the PSf/CA membrane to 86%, 82%, and 79% for the membranes with PVP, Plu, and PVP/Plu, respectively. This confirmed the favorable adsorption capacity of the pore formation-controlling agents on the membrane surface, which increased the ability to remove undesired components and for alternative techniques when refining conventional processes. The authors are grateful for the support from the laboratory staff that helped with handling the equipment for the analyses involved in this research. This study was performed at the laboratory of Process and Food Engineering, Faculty of Engineering, Universiti Putra Malaysia (Grant No. 9477000). ASTM D256-10, “Standard test methods for determining the izod pendulum impact resistance of plastics,” D20.10, Ed. West Conshohocken, PA: ASTM International, 2010. [Online]. Available: www.astm.org. Greenberg, A. R., Khare, V. P., Zartman, J., Krantz, W. B., Todd, P. (2003). “Macrovoid defect growth during evaporative casting of polymeric membranes,” 2002 Microgravity Materials Science Conference, 268-279; NASA/CP-2003-212339. Hamzah, S., Ali, N., Ariffin, M. M., Ali, A., and Mohammad, A. W. (2014). “High performance of polysulfone ultrafiltration membrane: Effect of polymer concentration,” ARPN J. Eng. Appl. Sci. 9(12), 2543-2550. Van der Graaf, S. (2006). Membrane Emulsification: Droplet Formation and Effects of Interfacial Tension. (Thesis). Wageningen University, The Netherlands. Yamasaki, A., Tyagi, R. K., Fouda, A. E., Jonnason, K., and Matsuura, T. (2000). “Effect of surfactant as an additive on the formation of asymmetric polysulfone membranes for gas separation,” in: Membrane Formation and Modification, I. Pinnau and B. D. Freeman (eds. ), American Chemical Society, Washington, D.C., pp. 87-95. Article submitted: July 20, 2018; Peer review completed: August 26, 2018; Revised version received: October 4, 2018; Accepted: November 24, 2018; Published: December 3, 2018.